I’ve never hidden my affection for stripes, as well as stripes on stripes. Here is my summer version of Jermyn Street: pin-striped tropical weight wool with crisp cotton striped shirting. To fully behold the pin-stripes, you may have to click on the photo to make it bigger. I still get print catalogs from JCrew and am appreciative of the service. The catalog puts the best new stuff in front of me while it’s still available; who knows when I would find it on my desultory trips to www.jcrew.com. For instance, the catalog showed me this great top . . . which sold out quickly in this color. This bow is almost too cute, but it stops just short of that mark . . . I think. I have a colleague whose personal style is expressed in simple, unadorned lines and she once told me, I can’t wear anything with a bow on it. I think of this often, and wonder if my periodic indulgence in bows (one at a time, mind) is a sign of gaucherie. This top is generously cut and therefore size 4 is a little big on me. You know what? The easy fit is nice in the heat. When I look down, this is what I see. Just a bit of shoe. But what a shoe it is! So what we have here is actually stripe on stripe on stripe. Perhaps you are wondering what today’s lesson is? All things in moderation (bows) until they are not (stripes). Snappy! 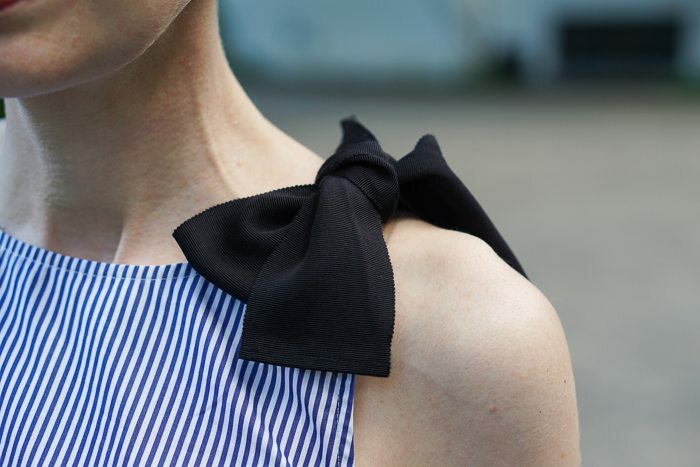 Two shoulder bows might seem cutesy, but one is just right. I know I’m being repetitive, but I love the outfit! It’s snappy! How does the wool feel in humid DC? Does it truly work for hot climes? Hi gk — The wool feels great. It’s very light and the pants are unlined. Wool is one of those miracle substances that seems to anticipate your needs and be what you need. Kind of like roughage! In my eyes, the dark bow paired with the dark trousers looks graphic not cutesy. And the shoes, sporting a bow too! Bow on bow! I agree that one bow, paired with the dark pants, is just right, as is the sly reference to PD Wodehouse! I saw a Fry and Laurie skit last night — posted somewhere on The Toast — based on a fictitious pageant called Young Tory of The Year, in which contestants bloviate (literally stringing together phrases like “family values” and “why not corporeal punishment” with no content or even sentence structure) with the backing of a symphony orchestra. You must check it out. I like seeing a flat shoe with the “baby boot” flared pants (as opposed to the 1970’s Partridge Family mega-flare). As a tiny person, for too long, I was all about heels to make me even with the rest of the world. The return of semi-flares (which I’ve now several of) and 70s flares (I’ve only succumbed once with weekend jeans to channel my inner Laurie/Susan Dey) for me seemed to need heels – the pant properly hemmed would fall just so without a break. But lately it isn’t just my tired feet that made me start focusing on flats / loafers or 1-1.5 inch heels, but that I see how well they work with that semi-flare with a slight break. 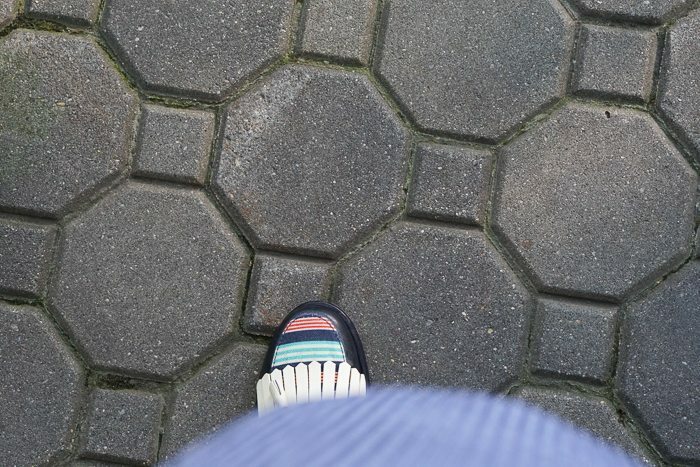 Your outfit today exemplifies that shift in perspective for me. The paradigm shift! In the 90s I always wore pants that hit just around my ankle with flat shoes and when the bootleg cut came in (in the early 00s?) I noticed everyone else wearing their pants longer and thought I should try it. And now I am a total convert to the break! I like print catalogs and (for any retailers mining blog comments) I mark things I like and sometimes end up buying them. More so than glossy magazines I often see outfits made up of ingredients I already own. The top is pretty casual and I’m a shorts person so I’d probably have shorts instead of long pants. A very fresh look. 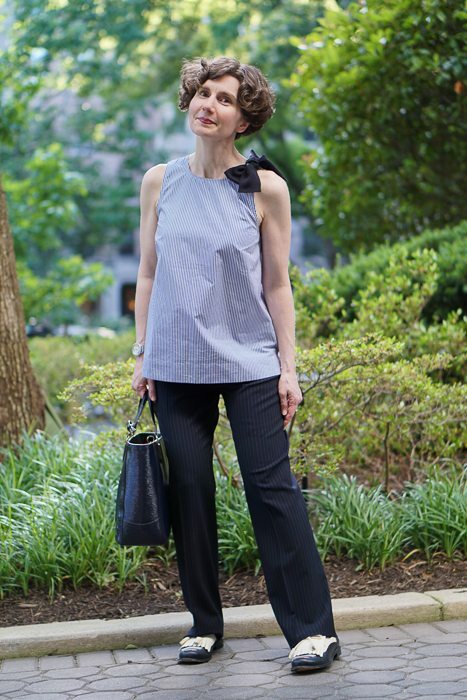 I love the bow, but how about a more tapered pant to balance the cut of the top? Love your blog! That’s a great idea, Susan. White jeans! Ooh! My first garment shared with the Directrice, inspiring me to de-lurk! 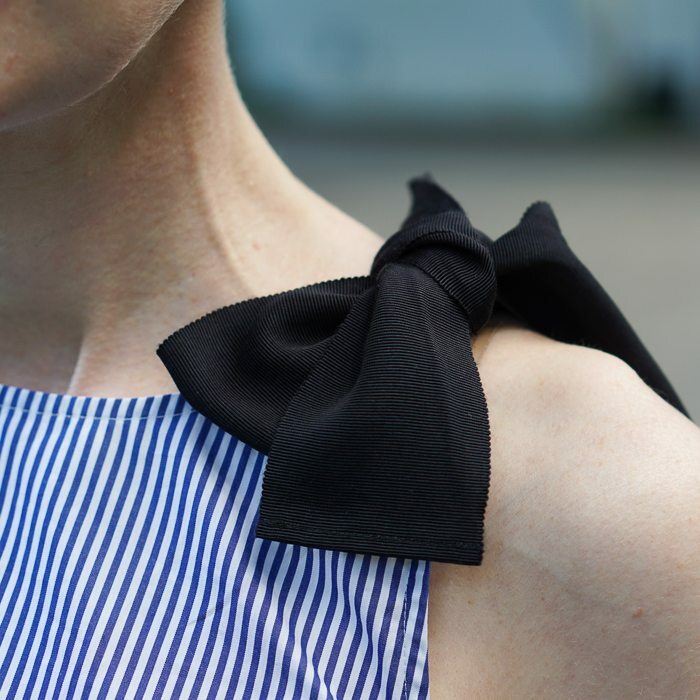 I, too, questioned whether the bow was too “too” but decided the crisp navy ribbon, tailoring, and stripes balanced the potential for “twee.” So far, I’ve worn it casually with navy ankle pants and white skinny jeans. I suspect a pencil skirt (perhaps coral) will be next on my hit list. Interestingly, in store, my JCrew saleslady suggested layering this top over a blouse (she suggested chambray) for work. This would appear to be Advanced Layering to me (getting the collar right! what about the dueling armhole cuts? ), but perhaps that’s right up your alley? Cat — You are way ahead of me! You describe great combinations. Perhaps a citron skirt, too? As a layering practitioner and theorist I can see the idea of layering this top, but think that look might be too youthful on me. 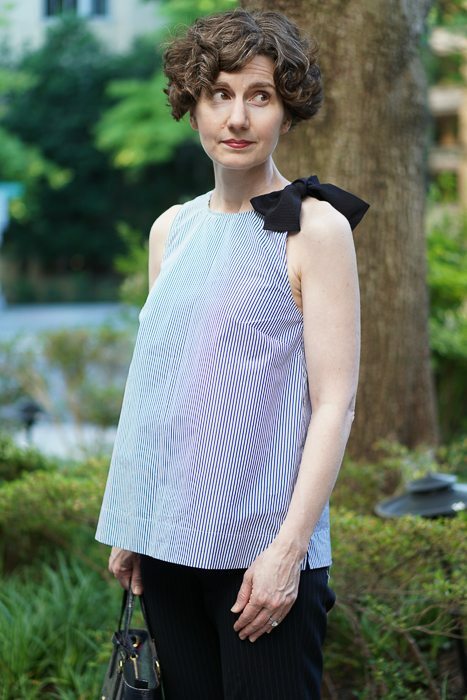 Maybe it would be best with a mandarin collar blouse? Love it! Crazy, adorable shoes keep the top from being too earnest. And the Directrice is starting to change my mind about stripes . . .